The Farm House —- Momma and me. Each time I watched my mother cook or bake I became excited and wanted to help so I could learn what she was doing. The different flours were a mystery to me and there was white sugar and more than one brown-colored sugar. The covered crock with a very dark brown sugar was the best. It was soft and moist and tasted like molasses. Sometimes that same sugar dried out and Momma filled a little, plastic container in the shape of a fat chef with water and buried it in the drying sugar to moisten it. I was mesmerized by all Momma made in the kitchen and saw her Angel Food whip/spoon, the spritz cookie press, the electric mixer with its big clear bowl and the nut chopper as clever animated characters that beckoned me to use them. Even though I yearned to be a part of this world I worried if I would ever be adept enough to turn a bowl as easily a Momma did when she was beating a batter; or would my flour covered hands be able to turn a soft, pliant yeast dough as easily as hers. So often as Momma made graceful swirls with the frosting on a cake I thought, “Just think if I know how to do that, well then, I can lick even more frosting than Momma gives me”. Of course, if I tried to eat too much, she would stop me, but oh, how I wished I could do all those things. Unfortunately I did not understand how much there was to learn if you wanted to cook and bake! I wished, yet somewhere in side me I knew I didn’t realize how much I had to learn, nor did I comprehend how much time would be needed learn all the intricacies of cooking and baking! I continually daydreamed about cooking and baking, yet I was afraid to ask my parents because I knew my father wouldn’t allow me to anything and unfortunately my mother rarely tried to change his mind.’ I needed a good plan to be successful and finally one formed in my mind. 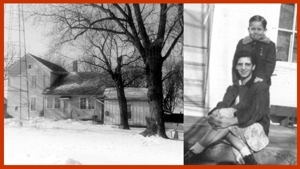 On the morning of my mother’s birthday in 1957, she and my father left for most of the day. They said they would return in the afternoon. It was the second time they left my sister and I alone on the farm and this time they would be gone a long time; it would be enough time for me to make a cake—a cake for my mother’s birthday. Just as soon as they left, I begged my sister to turn on the oven for me. She was twelve and I 10. Although we were close in age, she knew how to light the oven. My sister gave me the third degree about the oven and wanted to know what I was going to do. I told her I wanted to make Momma a birthday cake. She questioned how could I since I had never baked. In my little baby brother voice, I asked if she would make sure I read the recipe properly and check if the ingredient’s measurements. The oven was on. All that I had to do now was get the ingredients ready for my sister to check. Happiness spread across my face in a big grin. Everything was going great! When I was done preparing my sister checked things out and gave me the go ahead. She also told me to be very careful! As I mixed the ingredients, I questioned the term “cream” next to the butter and the sugar, but continued putting all the ingredients into the bowl all at once. It was difficult for me to stir everything together but I did the best that I could. I put the batter into the pans and placed the cake in the oven. The last thing to do was to set the stove timer so I would not forget to take the cake out in time. Without another thought, I ran from the house to play in an old summer kitchen that was a distance from the house. Time passed and I continued to play. After a while longer, I glanced at my Roy Rodgers watch and saw that more time had passed than what I had set on the stove time. I returned, breathlessly, to the house and opened the kitchen door with trepidation and excitement. This was my first baking adventure and it had to be good! As I slowly opened the kitchen door, I smelled something strange. I bent slightly, potholders in hand, to reach for the Roper oven door. I pulled the handle down to look at my cake. Inside the dark Roper oven the shiny aluminum pans, glimmered against the badly burnt and flat cakes inside. The edges were black, as well as the center of the cake. Huge tears flowed down my checks in rivulets of anguish. I cried so loud my sister came running. We both decided it was best to get rid of the evidence. She told me to take the cakes outside and dump them somewhere. When Momma and Daddy arrived home, the kitchen was clean and cool as it was when they left. Daddy went out by the barn and Momma came to the house. As she entered the house, she stopped immediately, looked at me and asked, “Where is the chocolate cake?” I broke down in tears! Momma took my hand and asked if I had been baking. I nodded yes. She then asked to see what I had made. Eventually I took her hand and led her to the pig bucket under the big tree. Momma looked inside, smiled and motioned to return to the house. We walked hand in hand back to the house. My tears continued. Inside she wiped the tears from my cheeks and told me if I wanted to bake then she would teach me. Next, she gave me a kiss and a hug. From that day on, every Saturday Momma taught me something new to make. The next Saturday we made the cake. This time Momma had a birthday cake from me! Posted on March 13, 2008 September 5, 2010 by suntithenaiPosted in True StoryTagged Birthday, Chocolate Cake, Momma. Unfortunately, I never learned the “knack” for baking anything. I loved the reference to the summer kitchen. I remember the one at my Grandma Hien’s…I was fasinated with a kitchen that was outside…I later learned the wisdom of it when we canned jar after jar of green beans and tomato juice…I wish I had one now. Your momma was remarkable. My mother would have scolded me for having the oven on without her in the house, but your momma recognized that she had a “budding” chef on her hands….it is a natural, God given talent that you have, Frank. My mother never yelled at me for anything that like. My father, on the other hand, I think was very displeased. But Momma was always patient with me and showed me whatever I wanted. Its funny, though, my sister was my father’s darling and could never do wrong, where I was always doing something he didn’t like. Momma’s baking was superb. I remember the last cake she made for while we lived in Arizona. There is a picture of that traditional birthday cake in a new post–Facing Reality of Crepusculum in a Smilebox slide show. It usually looked the same each year, although the one shown is tiny compared to the ones she made on the farm. Yes, I have fond memories of the summer kitchen I(new story!!!) and my Momma’s tomato juice was to die for. I should send you a quart. Its dynamite when it becomes a bloody Mary! !